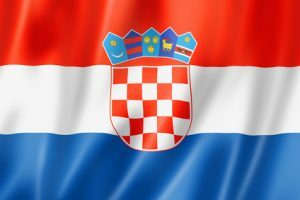 Interested in finding out more about the Croatian flag and anthem? You’ve come to the right place! Here we look at the history of the Croatian flag and you can also have a listen to the Croatian national anthem. The Croatian flag – as shown below – was officially adopted as the flag of Croatia in December 1990 (although it had been in use since July 1990), prior to the country’s declaration of independence in June 1991. The red, white and blue colours – used in the flags of several Slavic countries – have actually been used in the flag of Croatia since 1848. Likewise, a coat of arms in the centre of the flag (although not the same one in use today) was also used in Croatian flags in the 19th century – an early version contains the shields of Croatia, Dalmatia and Slavonia. Prior to the use of this flag, the flag of Yugoslavia was, of course, used in Croatia. This flag also used blue, white and red horizontal stripes, with a red star with gold edging – the standard communist symbol – placed in the centre. The coat of arms in the centre of the Croatian flag is actually made up of a chequered shield with five individual coats of arms of various provinces and towns above it. These provinces are those from which Croatia emerged and formed. They are – from left to right – a crescent and star (the oldest known coat of arms for Croatia); two red stripes on blue (the coat of arms of Dubrovnik, which exists from when it was the Republic of Ragusa); three golden lion heads (the coat of arms of Dalmatia); a golden goat (the coat of arms of Istria); and a gold star above a black marten, a weasel-like animal (the coat of arms of Slavonia). The famous chequered part (which has lent itself to a number of Croatian sports outfits – the Croatian football team‘s kit is certainly unique!) is thought to originate from as early as the 10th century when it was a symbol of the Croatian kings of that time. 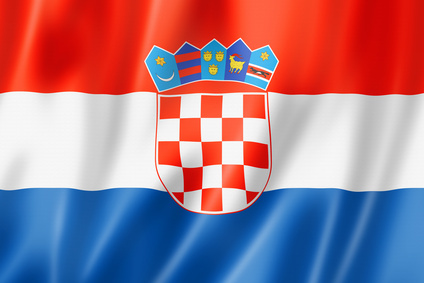 A very detailed history and further information about the flag can be found at Flags of the World’s Croatia page. The national anthem of Croatia is “Ljepa nasa domovino” which translates as “Our Beautiful Homeland“. The anthem originates from the 19th century, and was also used as the anthem of Croatia when it was part of Yugoslavia. It became the official anthem of the country of Croatia upon independence in 1991.